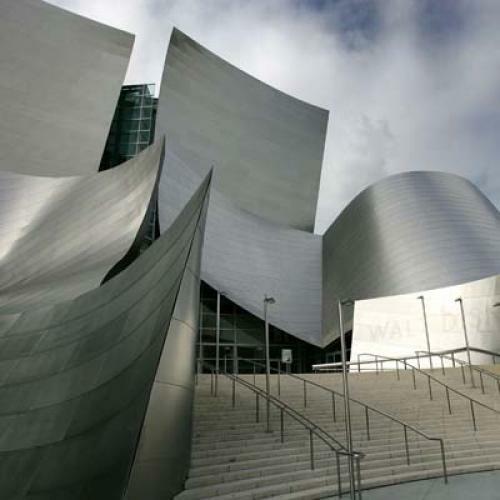 FOR WELL OVER a decade now, we have been flipping through glossy photographs and watching videos of Frank Gehry carefully studying crumpled wads of paper, selecting which one to slide across some large drawing table to an assistant-in-waiting, who will scan it into the computer and, with Gehry, endeavor to make and call it architecture. The Guggenheim Museum in Bilbao celebrated its tenth anniversary this fall with a group of exhibits as self-congratulatory as the fanfare surrounding Gehry’s most recently completed project, his IAC (InterActive Corp) Building on the west side of Manhattan. Need I even describe it? It is wavy. It is monumental. Its surfaces--transparent and translucent glass--play with, reflect, and model light. In different iterations we have seen it all before, and before, and before, in the Guggenheim Bilbao, the Disney Concert Hall in Los Angeles, the Ray and Maria Stata Center on the MIT campus, the Fisher Center for the Performing Arts at Bard College, the Experience Music Project in Seattle, the Pritzker bandshell in Millennium Park in Chicago, the American Center in Paris, the proposed skyscraper for the controversial Atlantic Yards project in Brooklyn, and the proposed Guggenheim museums in New York City and Abu Dhabi. When Gehry started making this kind of architecture, it was innovative. It helped to change not only what we expect buildings to look like, but also how the architect works. While the seeds of his aesthetic can be discerned in his earlier projects, Gehry could not have developed it without new digital technologies. Computer-aided design (CAD, of which Gehry developed his own version, known as CATIA) makes it possible mathematically to diagram Gehry-like concatenations of irregular curves into working drawings that the contractors who actually build these buildings can understand and use. Computer-aided manufacturing (CAM), the development of which Gehry has also spurred, allows him and other architects to produce computer-generated three-dimensional drawings of, say, steel-plate cladding, which can be zapped directly to a manufacturer, who employs those same drawings to generate the final product. THROUGH THE CREATIVE use of these and other new digital technologies, Gehry and the architects who have followed his path to wavy buildings have been able to streamline what had been the typical laborious process: schematic design, design development, construction documents, construction and its oversight. In doing so, these architects have wrested back a modicum of design control from the construction and manufacturing industries by employing design and manufacturing processes that lessen their reliance on how building contractors, various consultants, and parts manufacturers interpret or misinterpret the architects’ own construction documents. As riotous sculptures, Gehry’s wavy buildings look impressive from the street--although even this is partly a matter of taste: to an artistically trained eye, he is far less compositionally talented than he, his clients, and the worldwide publicity machine that promotes his designs would have us believe. But even if one appreciates these buildings’ exterior views, they often fail to reconcile their fancy skins with the demands of habitable, functional, enlightening interiors and outdoor spaces. Gehry’s titanium-clad buildings (such as Bilbao and some others) convert sunlight into blazing heat. Many of these buildings have flowing opaque skins that discourage apertures to admit and sculpt and control natural light indoors. His overall approach to design suggests nothing about how to make a plan that resolves or stimulatingly interprets the building’s program, makes spatial sequences, or folds into or works with its site. Gehry has often finessed these architectural challenges by using the building’s skin as a figurative textile that he drapes, or drops, on top of the spaces that his buildings’ users inhabit in all the usual and time-honored ways, spaces which are themselves at best ordinary and at worst incoherent and oppressively residual. It is a somewhat damning admission. And recently a host of many younger and less well-known firms--Foreign Office Architects, Office dA, MAD Architects, UNStudio, to mention only several of the more talented ones--are taking the next step. These firms are using the computing power and the manufacturing and material possibilities of new digital technologies to integrate a building’s exterior aspects with the many other--and equally important--considerations that go into making good architecture: the building’s plan, sections, structural and mechanical systems, materials, program, site, light, space, environmental concerns, and so on. As in UNStudio’s house in the Catskills, recently displayed in The New York Times Magazine, wavy curvy exteriors are now torquing into and through interiors, making ramps and ceilings, concretizing structure, opening into skylights, making space. The work by these firms glories in its own complexity. “Complexity” is the design mantra of the day. THE BEST OF THE younger architects owe homage, or should, to one master, and it is not Frank Gehry. It is Enrique Miralles, a Spanish architect who died in 2000 at the age of forty-five. No architect works solo, and neither did Miralles, whose work was done in collaboration with two enormously gifted partners with whom he worked in succession, Carme Pinos (Miralles/Pinos, from 1984 to 1991), and Benedetta Tagliabue (EMBT Architects, from 1993 to 2000, which continues to practice despite Miralles’s passing). Though Miralles is largely unknown to the general public, at least outside of Spain and now Scotland, he enjoys a cult-like admiration among his contemporaries, both when their work looks like his and when it does not. Miralles died before he could win a Pritzker Prize (which should be awarded posthumously, to him and his two former partners, both of whom continue to build in separate practices), and before he could start padding his retirement accounts with building projects all over the world, and before he was called to design jewelry for Tiffany or furniture for Vitra or Knoll. Human life may be ephemeral, but in an ideal world, architecture is less so. Although Miralles died young, some of his projects stand. They are exquisite--some of the most uncannily intelligent buildings, landscapes, and public spaces of our time. Many look exuberantly wavy, but not because Miralles and his partners spent time studying crumpled paper. Critics tend to brand these projects with adjectives such as “intuitive” and “emotive”--words that, in the vocabulary of contemporary architecture, connote curves, Big Personality, a predisposition for the irrational, and (for some) a feminized sensibility. But to pigeonhole the work in this way is at best imprecise, and at worst just wrong. From the stark, breathtaking Igualada Cemetery (1985-1994) on the outskirts of Barcelona to the quietly exuberant Scottish Parliament in Edinburgh, this work, like Gehry’s, is often curvy--but it also masters the architectural qualities that Gehry’s buildings so often deny, combining exquisite analytical rigor with an almost poetic control over topography, siting, spatial sequence, natural light, color, and materials. BEST KNOWN, at least internationally, is the Scottish Parliament, which was finished by Tagliabue after Miralles died, and opened in 2002. Equally important are the projects he did in and around Barcelona, where he was based: with Pinos, the Igualada Cemetery and Olympic Archery Range (1992); with Tagliabue, the Market of Santa Caterina and the Diagonal Mar park (1997-2002). When these projects take off into curves, it is because Miralles and company decided that curves are what a particular architectural challenge evoked. There is no aggressive monumentality here, no cookie-cutter high-end product dumped wherever the money exists to pay for it. There is, instead, sensitivity and study. Miralles and his colleagues receptively investigated the landscape and the site. They considered when and how the people who were to use the structure or the landscape might live in, move through, and prospect space; how they might touch, and imagine touching, surfaces. Sure, they made use of computers to actualize their ideas. But their architecture neither starts nor stops with skin, or with what digital technology offers. Steeped in architecture’s history, Miralles used architectural precedents when they offered reasonable solutions to problems that, in the words of Viennese modernist Adolf Loos, had already been solved. Steeped in art, nature, and local traditions, Miralles playfully engaged architecture’s metaphorical possibilities. Contemporary cognitive scientists maintain that reason relies upon a heavy dose of the intuitive and the metaphorical, and this architecture threads intuition through the rational. It lucidly solves architectural problems, and at the same time it creates buildings out of human experience--out of materials and textures, and out of metaphors drawn from nature, historical precedents, contemporary art, vernacular craft. Never are these buildings “intuitive” or “irrational,” at least not in the conventional sense in which critics use such words. If they are “organic,” they are never romantic indulgences, or mere effusions of sensibility. A major governmental building such as a parliament is a once-in-a-lifetime commission for nearly any designer. And Miralles’s Scottish Parliament is big: 312,000 square feet of internal space. So the first surprise is that, unlike any other parliament building I know--A.W.N. Pugin’s Houses of Parliament in London, the U.S. Capitol in Washington, the new-old Reichstag in Berlin, Le Corbusier’s Assembly Chamber in Chandigarh, Louis Kahn’s National Assembly in Dhaka--when you come upon the Scottish Parliament, you only barely register that you have arrived. To Gehry’s riotous, self-advertising extrusions, EMBT quietly counters with an anti-monument. The Scottish Parliament is so disaggregated, so broken down in scale, so harmonized with its surroundings, so folded into the streetscape and landscape (which EMBT also designed), that one barely apprehends the enormousness of the building’s presence. FROM THE CANONGATE at the lower end of the Royal Mile, the first hint of the building is the short end of a thin rectangular slab, the office block for the Scottish members of parliament, which ranges from four to six stories and delineates the northwestern boundary of the site. This block is anything but a typical office building, with its three-dimensionally patterned and highly varied coloration, and its mixture of textures and materials. Its animated exteriors create a smooth transition between the existing pre-modern four-story stone urban fabric to the north and the concatenation of EMBT-designed structures to the south that constitute the bulk of the parliament. At the end of the Canongate, across from Holyrood Palace on the south, with Salisbury Crags to the southeast, one comes upon what seems to be, quite simply and without any irony, a lovely place. Here are curving grass-covered embankments and a lawn (these hide the services and the multilevel parking garage), reflecting pools in zig-zaggy curves, and low-slung, bench-level walls upon which people sit, read, skateboard, or bike. The curves of these benches and reflecting pools are subtle spatial and sensory pointers to proceed inside. One of the strengths of the Scottish Parliament, and indeed of most of Miralles and his partners’ work, is its utter disregard for the traditional disciplinary boundaries separating architecture, landscape architecture, urban design, and public sculpture. EMBT’s breathtakingly brilliant Diagonal Mar park, smaller in scale than the parliament project and not including a building, casts in sharp relief the qualities that make the other projects by Miralles and company so complex. This park, done as a part of the vast overhaul of Barcelona in conjunction with the city’s hosting of the Olympics in 1992, is sited on several former industrial plots in a pancake-flat transitional neighborhood populated by old warehouses, new hotels, disused lots, and a new shopping mall. Joy. Exuberance. A ferocious commitment to vibrant social engagement. A deep appreciation for the profundity of historical experience. A profound sense of our multisensory engagement with the world. These are the qualities that make the Diagonal Mar both a key to Miralles’s and Tagliabue’s aesthetic and one of the greatest public spaces of our time. The Diagonal Mar is a multi-leveled, poly-dimensional extravaganza of constructed hills and eddies, graduated layers of reflecting pools, fountains, sculptures, grasses, terraced and pebble- covered paths of many textures and hues. Huge spider-like metallic sculptures, irregularly placed, articulate the principal pedestrian walkways. Sometimes these sculptures fork in two, opening into ladders for little climbing feet. Sometimes, at ground level, they appear just to wander this way and that, landing in a reflecting pool or a grassy depression. Some serve double (or triple or quadruple) duty, creating ground-level fountains through which children chase one another in glee. Workers on their lunch hour relax on the park’s large man-made grass-covered mound, reading El Mundo. Anthropomorphic columns topped with bulbous “heads” and covered with inlaid broken ceramic tiles lumber through the site in earth-toned colors, textures, and patterns that wittily update Catalan vernacular traditions, adding another layer of complexity to the composition. Both these projects revel in complexity, but the Scottish Parliament in particular demonstrates that this complexity is not confined to a building’s skin, or to one or two dramatic interior moments. Instead it courses through a project’s design, site plan, massing, and spatial volumes. Curved volumes shape unique and, at moments, uniquely beautiful moments in the history of architecture. The boat-shaped towers housing the council chambers mold spaces that are exquisitely proportioned to the human body. Their transparent clerestory windows and occasional skylights wash the interiors with direct and indirect natural light, simultaneously eliminating glare, editing out views onto the four-lane Queen’s Road, and offering carefully selected glimpses onto Salisbury Crags. The Scottish Parliament’s interior has four principal parts. The main entrance contains a public exhibition space and a tucked-away cafeteria and gift shop. Between the office block to the north and the assembly chamber to the south are the SMP communal spaces (which, owing to security considerations, are typically not open to the general public). These are constituted by a single-story, amply proportioned, complicated, and apparently disaggregated series of gathering spaces covered by twelve large leaf-shaped skylights interspersed with patio-like interior gardens. The atmosphere within pulsates; it is simultaneously gracious and informal. These areas, beautiful in themselves, spatially prod the members of parliament into informal encounters with one another. On any given day when parliament is in session, one sees dozens of people sitting here: on benches, on the monumental staircase leading to the assembly chamber, and in the cafe, talking in small groups. Like leaves upon a branch, these skylights converge into the monumental staircase that leads to the splendid assembly chamber, which turns up the volume on this skillful balancing of informality and monumentality. The assembly chamber’s enormous free-span amphitheater, suspended one level above the ground plane, is supported by irregularly disposed, canted, rectilinear supports: concrete posts that convey the impression, as you walk up the staircase leading inside, that they have impulsively decided to accompany you. Inside, daylight floods, but few views outside distract. The windows facing outdoors are screened with the same irregularly disposed wooden rods that cover many of the building’s internal and external facades, and in the glass-paneled wall onto which the parliamentarians face, views of passersby are shielded by whisper-thin sheets of sycamore pressed between twinned panes of glass. The result is a golden light reminiscent of Buddhist temples, where the little squares of gold leaf pressed by worshipers onto massive statues of the Bodhisattva reflect daylight, candle light, any light into an ethereal glow. THE concrete-and-wood assembly chamber, also leaf-shaped in plan, is a huge free-span room unlike any other monumental interior in modern architecture that I know. Its seeming disarrangement of changing levels, combined with a muscular dropped wooden ceiling similar to an inverted boat hull, breaks down the room’s large scale and evokes the timber-roofed ceilings in the grand meeting halls of Scottish castles. Complexity results not in dissonance but in harmony. As elsewhere, Miralles (again unlike Gehry) uses geometric irregularity not for its own sake but to make a better room. The arc-shaped seating area for the parliamentarians has a spatial coherence and grandeur; the second-level galleries housing onlookers, tucked into the pointed ends of the “leaf,” create a sense of intimacy. This parliamentary chamber is both ennobling and comfortable. Modern and with a sense of history, it could not have been built without up-to-the-minute technologies. Its peel-the-scales-off-your-eyes newness at the same time summons multiple layers of associations. How many designers could accomplish such a feat? By far Miralles’s largest project, the Scottish Parliament is not without flaws. The facades’ layering and appliques only rarely coalesce into the complex, three-dimensional patterns that EMBT surely sought, and that Miralles and Pinos successfully constructed in the Igualada Cemetery. Sustainable? Not as green as it could be, probably, though the building does use green roofs, natural ventilation, and other now-familiar tropes of environmentally sensitive architecture. Expensive? Certainly. More expensive than necessary? Probably. The Pantheon wasn’t cheap, either. To live in the twenty-first-century is to live in a historically unprecedented degree of complexity--to be bombarded by images, data, demands, and experiences, some virtual, some real, most ephemeral, many unsettling. Serenity is out. Classical balance and calm are out. (A backlash, though, is on its way in.) Miralles and his partners, like Gehry, and like the digitally besotted forty something generation of architects, revel in complexity. But then Miralles and his partners do a truly revolutionary thing: they slow complexity down. This architecture shows how you can live in this world without being consumed by it. It is artful; it is sculptural; it is wavy. But it is very much more. It offers places of experience that transform our social interactions and our awareness of being in the world.